While this was my third time reading this novel, I’ll admit that it still has a bit more angst for my liking. However, it’s very good even still. The angst makes more sense when you read the books back-to-back, since Cedric’s death is fresh in your mind just as it would have been for Harry. 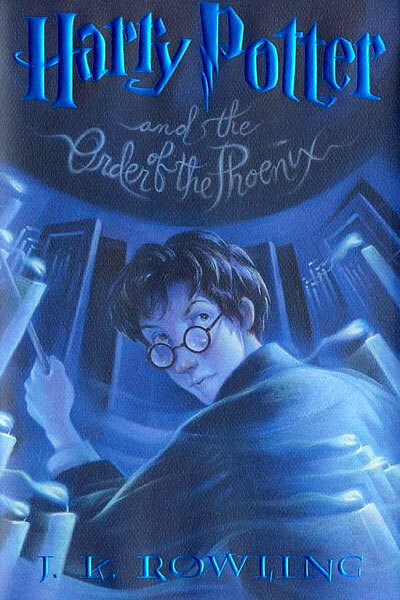 I remember the first time I read it, I was irritated with Harry and found him annoying. But this time around, while he was still frustratingly tempter-tantrum-y at times, he was much more understandable.In any case, the most interesting aspect of this novel is the oddly manipulative/unhealthy relationship going on between Sirius and Harry. Harry’s character has to endure some unusual strain as he works hard to keep Sirius happy, and Sirius’ carelessness and selfishness is disappointing. This is one of the first indications that Harry is really growing up — maturing a bit, at long last.Of course, there’s a lot of other interesting stuff going on here as well. The whole thing about self-control, closing your mind, and keeping your emotions in check…what are we supposed to make of the fact that Harry can’t do it? That he’s so emotional he can’t shut it off, even when it could mean the difference between life and death, between revealing the Order to Voldemort and maintaining the secrets he knows? If he’s such a great wizard and he’s supposed to be able to defeat the most powerful wizard of their time (aside from Dumbledore, that is), then shouldn’t he be able to control his anger? Or perhaps that’s part of the whole Harry-Potter-is-different-because-he-can-love thing that just keeps on coming up from the first book on. He’s so full of emotion that he can’t keep it all in check….Even still, I can’t complain too much. It’s good. It keeps your interest, it makes you want to keep reading, it’s interesting and has depth and is actually substantive. Now on to book six….